If the zeros are real [ ], then the two-zero case reduces to two instances of our earlier analysis for the one-zero. Assuming the zeros to be complex, we may express the zeros in polar form as and , where . is again the difference equation of the general two-zero filter with complex zeros. The frequency , is now viewed as a notch frequency, or antiresonance frequency. The closer R is to 1, the narrower the notch centered at . The approximate relation between bandwidth and given in Eq. (B.5) for the two-pole resonator now applies to the notch width in the two-zero filter. 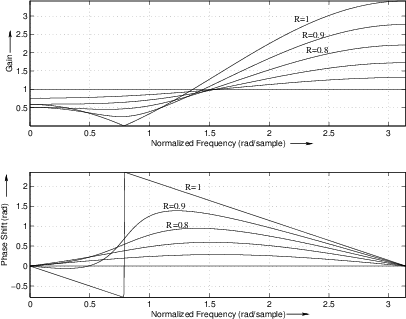 Figure B.8 gives some two-zero frequency responses obtained by setting to 1 and varying . The value of , is again . Note that the response is exactly analogous to the two-pole resonator with notches replacing the resonant peaks. Since the plots are on a linear magnitude scale, the two-zero amplitude response appears as the reciprocal of a two-pole response. On a dB scale, the two-zero response is an upside-down two-pole response. with fixed at and for various values of . (a) Amplitude response. 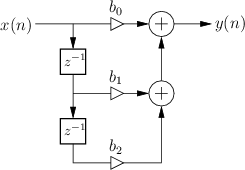 (b) Phase response.